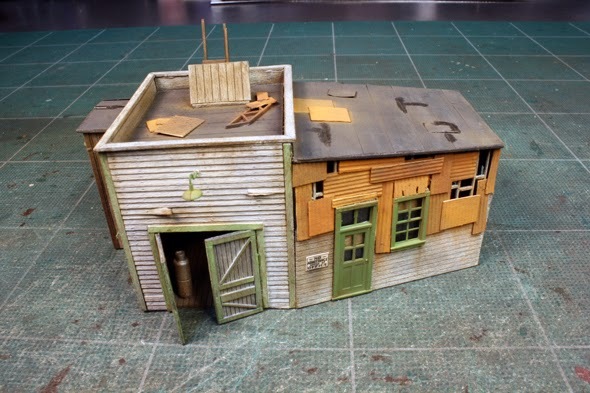 The finished model is ready for the Westboro scene on the WRD. 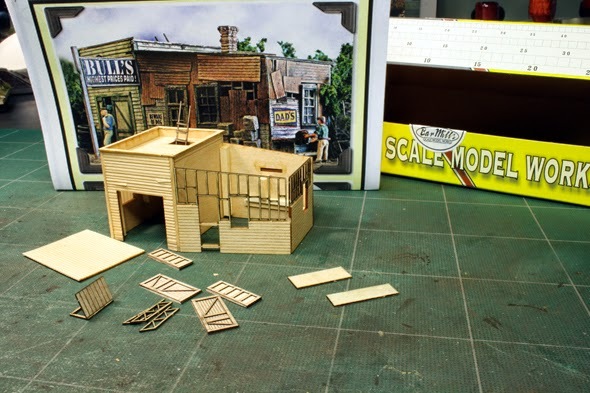 I did not build it as a salvage yard structure, but as a railway shop storage building. I have two locations it can work well at...just need to decide on one. 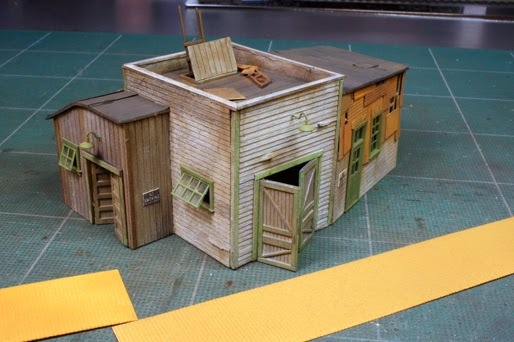 The three pieces in the foreground complete the rear lean-to. The doors are all two pieces that have a sticky backing for assembly. I used canopy cement for all my joints. I pulled a few of the boards up and also added nail holes as seen in the diagrams. 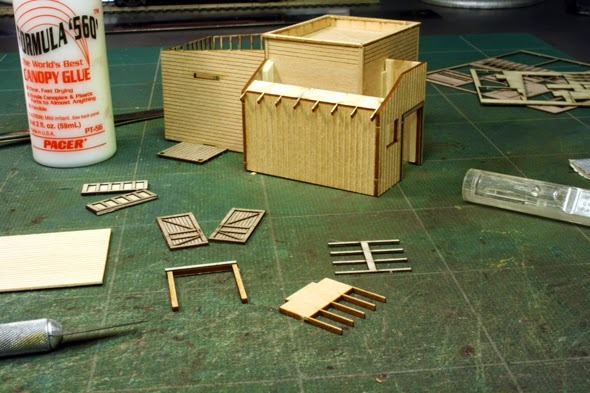 The main components are all applied and the wooden pieces got a coating of Hunterline weathering mix. I modeled the large doors as open requiring a flooring section to be added. Once the stain dried I applied a wash of Floquil grime followed by some reefer white. The windows, door trim and corners are all painted coach green. This also was a wash...not full strength. 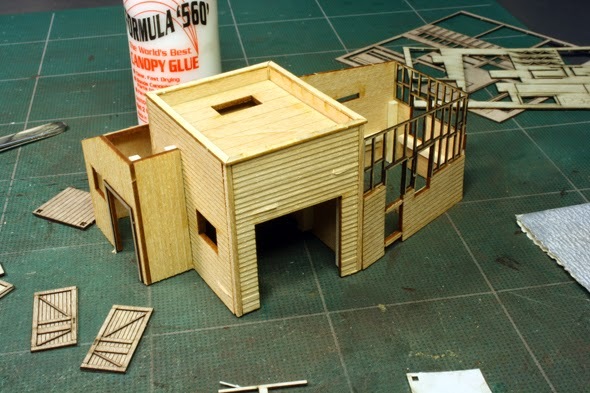 I had finished the model and still had a lot of leftover roofing as seen here. 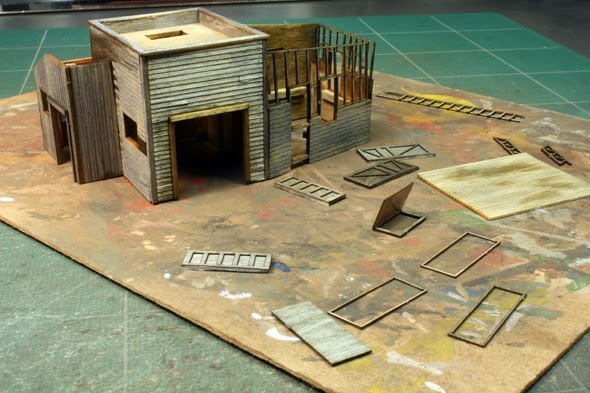 The sheets first received a coat of Floquil rust, then cut and weathered with Bragdon powdered rusts. 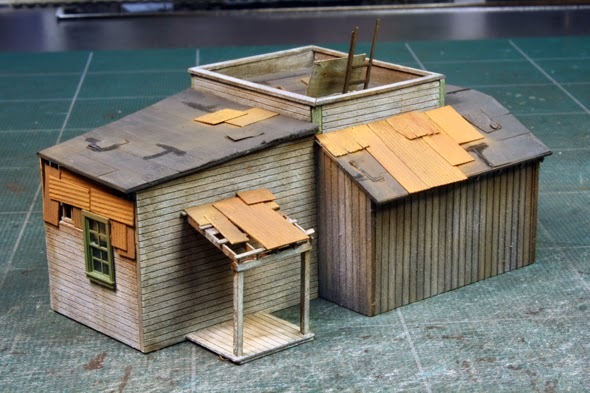 It was then attached to the roof and walls and extra weathering was applied as required. The window glazing was frosted before application. I added signs that I thought one would find on a storage structure. I really liked all the angles and wall types included with the kit. I used the tar paper supplied which got a wash coating of Floquil grimy black. This roofing took the paint really well and sticks and looks great. I did add some patches and tar marks at some joints using gloss medium. The steel sheeting was applied randomly to the roofing which adds to the final appearance. All the big door are modeled open as is the roof hatch which got a ladder installed. The swing out windows are also open. The overhead lighting was painted Floquil coach green. 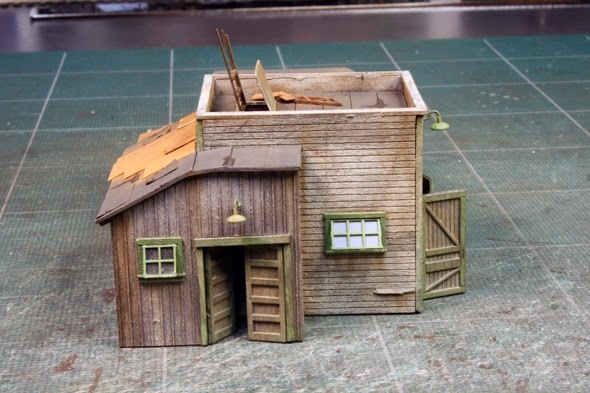 All the weathering was done with Bragdon powders.